What is an Impact Crusher? An impact crusher is a machine that uses striking as opposed to pressure to reduce the size of a material. Impact crushers are designated as a primary, secondary, tertiary or quarternary rotor crusher depending on which processing stage the equipment is being utilized. Roll crushers are a type of compression crusher mostly used in heavy-duty industrial/aggregate applications. Roll crushers were once very popular in the mining industry, where they were used to reduce excess rocks, ores, and other materials. A roll crusher uses two or more cylinders or drums which are connected to horizontal shafts that rotate in opposite directions pulling material through the crusher. The material you wish to grind or crush passes through the cylinders creating a finer and smaller product. The compression and opposite rotation of the two cylinders create the force and friction necessary to break the material passing through. 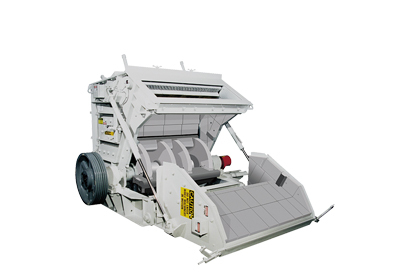 Stedman does not currently offer a roll crusher / jaw crusher. Jaw Crushers are mainly used in mining applications for grinding and crushing ores and rocks, but are not limited to the mining industry. Using compression methods, jaw crushers can handle and reduce many large sized materials. The jaw crusher uses a stationary jaw plate and a moving jaw plate to create a unique “V” shape. As materials pass through the machine, the moving jaw compresses and pushes the material against the stationary plate. This considerable amount of force then crushes the material down to a desired size before it can pass through the bottom of the Jaw Crusher. If it can be crushed, ground, pulverized or mixed, chances are we’ve done it. We have more than 10,000 test reports to help get you to the best solution quickly. There are full-size impact crushers in our Testing and Toll Processing Facility ready to test your material - contact us to arrange testing. To learn more about what to expect from testing, read this article that ran in POWDER BULK ENGINEERING magazine. A solid performer since its ground-breaking introduction the Stedman Mega-Slam™ horizontal shaft impactor effectively handles large feed sizes. The Stedman Grand-Slam™ is built to handle thousands of materials, ores and chemicals in wet and dry applications. The Stedman V-Slam™ is the vertical shaft impactor for all your coarse-to-fine crushing needs. It offers significant savings over higher-priced competitive crushers.